I forgot all about my Hobbit calendar for April. April is the scene where Bilbo opens the door and the dwarves come falling into Bag End. Gandalf is behind them laughing. It’s an interesting picture architecturally. The door is much bigger than it needs to be for a Hobbit. I would say Bilbo is about half the size of the door, yet Gandalf is leaning over to see in through it. It’s interesting to me because my original doorway for this Hobbit house was basically a typical 6 foot 8 inch door, rounded over to make it look circular. (We’ll get into the door later this year I suppose if all goes well) But every time I looked at the drawing I could tell something was not quite right. So I oversized the door on paper and it really made quite a difference in the look of the front of the home. I think you are going to like it. Well, if you are keeping score you will remember I had to make some phone calls after my last post. I had really made a disaster of the site with the excavator I had rented. There’s just something about operating an excavator that is very compelling for me. I called Steve who owns an excavating company in town here. I tell him what happened and that I need some help. He calls me back when he’s at the site and asks me who made the mess. I confess and say I need him to bail me out. I wind up meeting him over at the site after dinner and he comes up with some great ideas. He fixes the site digs the rest of the foundation and makes a ramp so that when we put the soil on the Hobbit house a year from now we’ll be all ready to go. He did it in like one day. It was unbelieveable. 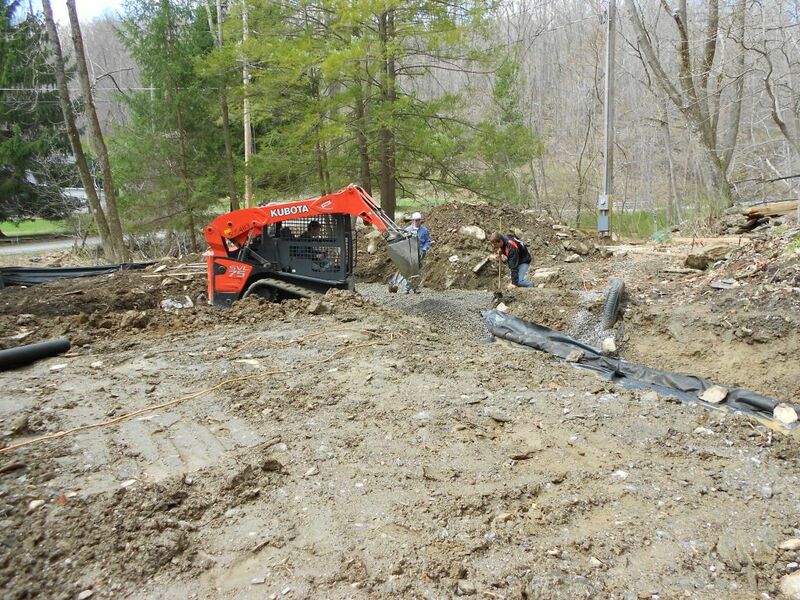 Here’s a picture of the excavation. It had rained the day before so it’s a bit flooded. Site prepped and ready for sub-base. Saturday April 14 6:30 AM: I begin the dreaded ditch digging for the footing drain. For those of you who are not learned in the ways of footing drains I will explain. The footing drain is basically a 4 inch diameter perforated pipe that runs along the side of your typical house footing. 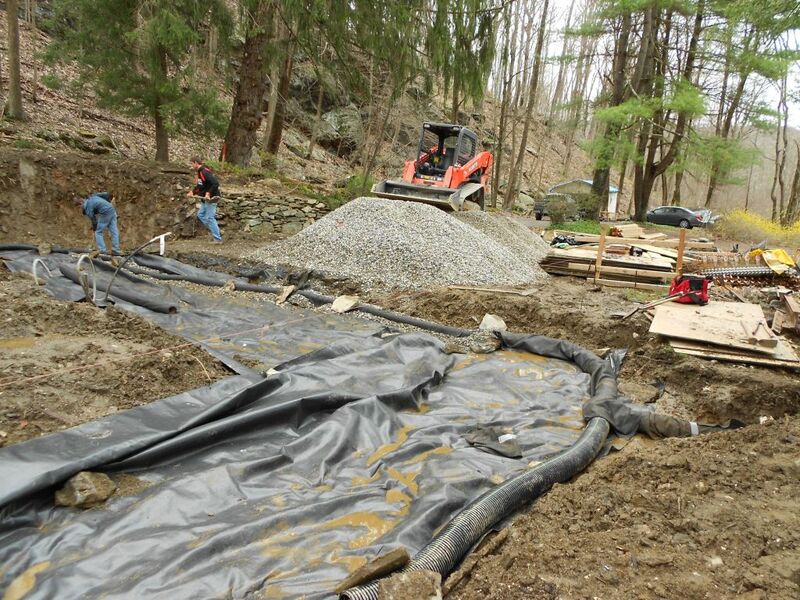 The drain is installed usually after the footing is poured on the outside edge of the footing. Builder’s usually pour the foudation walls and after that install the footing drain and then put crushed stone or gravel over the drain. A good builder would then put filter fabric over the gravel. The fabric allows water to get through but not soil this prevents the drainage system from clogging.So what we have in place is a gravel bed that allows water to travel through the dirt and escape into this layer of gravel. The 4 inch diameter perforated coil pipe I used is a facilitator for the water. If there is a lot of water in the soil it will drain much faster going throgh the pipe than just through the gravel alone. 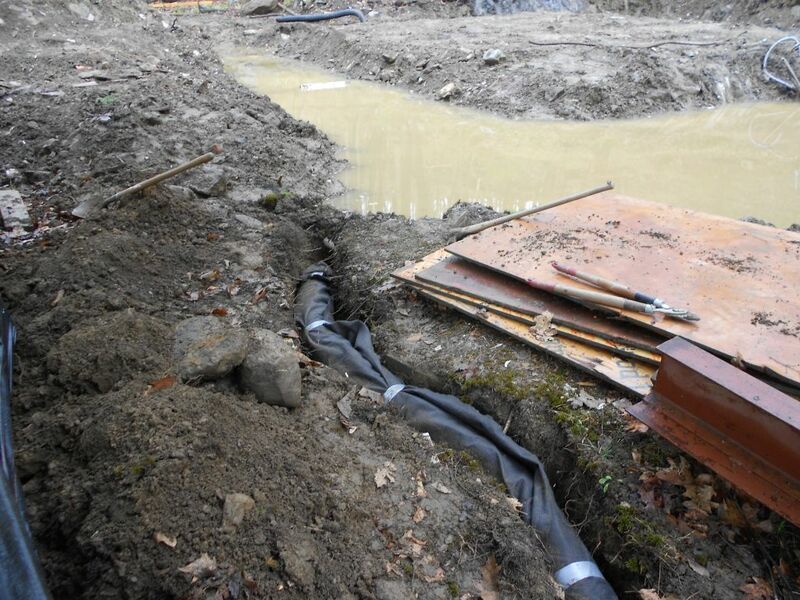 The key element of the footing drain system is running the pipe to daylight. Which is the task I had to start with on Saturday. The key to this task is getting the right pitch for the drain to daylight. I set up the laser level. I take a reading at the low point of the footing excavation which happens to be in exactly the place I need it to be. I don’t know how that happened but it wasn’t by design. (I guess the gods of Hobbit housess were watching over me.) I figure I need about a 6 inch difference in elevation to make this work and I find my starting point. 6:45 AM. I get my digging tools: long handled shovel, pick, tree branch cutters (for roots), long pry bar (for rocks). It had rained the nite before and was kind of misting out when I started. I was soaking wet by 6:50. As my wife would say “I’m sweating like Paddy’s pig”. They say the human body is made mostly of water, this body had significantly less water by the time I was finished. 452 roots later I reach my destination. Thankfully it wasn’t too rocky. I had some 6 inch perforated coil pipe left over from the curtain drain so I wrapped this in filter fabric and set it in the trench shown here. Perforated pipe wrapped in filter fabric in hand dug trench. 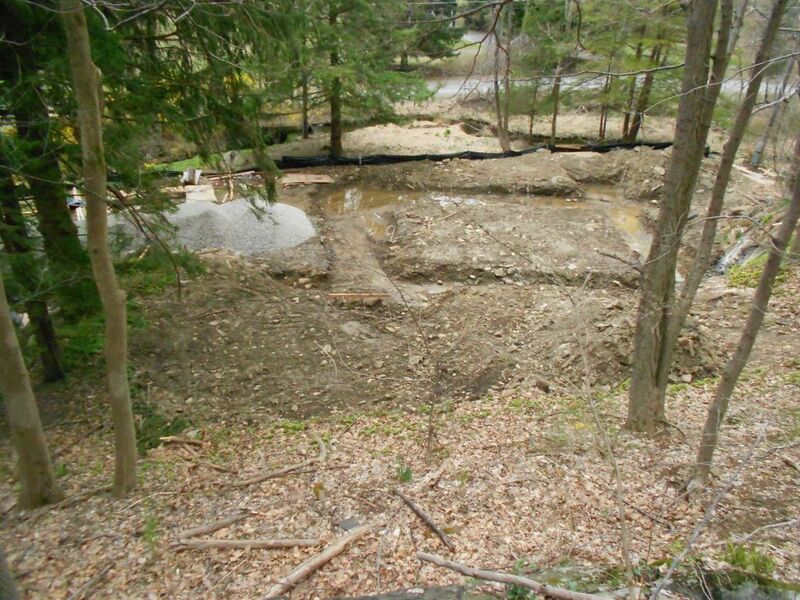 You can see in this picture how much water there is in the excavated area just from a little rain. I always liked watching water flow from stuff like this. I waited till my sons got there before I broke the dam. It took about 10-15 minutes for all the water to drain out. The pitch I made worked ot really well. After the draining of the excavation I got into the real work of the day, the foundation sub-base. One of the issues the engineers brought up was differential settling of the two main support walls for the Hobbit house. One wall is sitting on solid rock the other is sitting on soil. What they wanted me to do was put down stabilization fabric before putting the gravel sub-base down. What this does is put a barrier between the gravel and soil so that the gravel does not separate and get mixed in with the soil.They use stabilization fabric for roadwork. You have to purchase it by the roll so I decided to put it down wherever I didn’t have rock. It really is such a good idea especially for a house like this where there is going to be heavy loading. It kind of makes everything act as one unit and will really help minimize settling. What we did was layout the fabric and then install the footing drain around the entire perimeter before adding the gravel. We wrapped the 4 inch coil pipe with filter fabric as well so it won’t silt up in the future. Here’s a picture. Men of Bree installing footing drain and stabilization fabric. During the week I had Mike the local trucker bring over the washed gravel to the site. I originally figured I would need about 80 tons of material but I had him bring exta because I need it under the slab as well so it wouldn’t go to waste.He brought about 93 tons of stone…we didn’t have any left over. 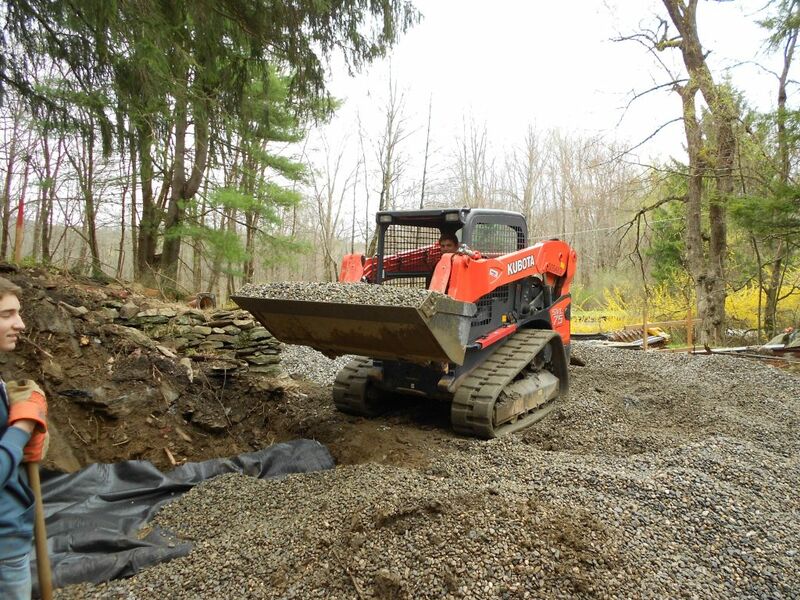 We used a Kubota skid steer to move the material. Roughing in the sub-base with the skid steer. 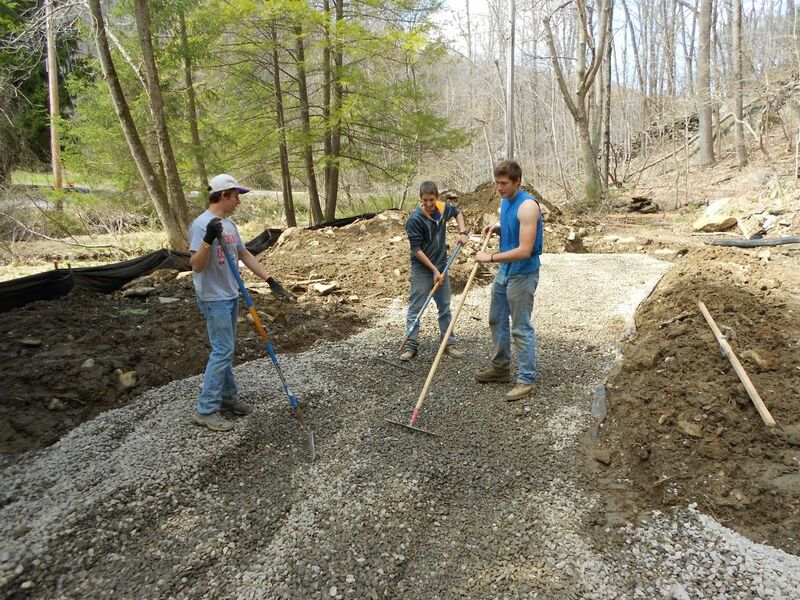 What we had to do is work our way aroung the foundation with a rough gravel grade. Once we got all the way around we backed our to the begining with a finish grade. We did this using the laser level and a benchmark that I had set on the telephone pole where the electric meter was. Laser level set to transfer elevations. What is the benchmark? The finish floor elevation as per our drawings is 506 feet. The original house first floor elevation was at 504 feet. So our finished floor height will be 2 feet above the original floor. So before I chopped out the first floor slab I took the laser level and transfered the original floor height to the telephone pole and put a 16 penny nail there so I wouldn’t lose the spot. This is our benchmark. Our bottom of footing elevation is 502. The laser level spins so you can get a 360 degree reading around the level once it is set up. The laser level comes with a reciever that picks up it’s signal and tells you if you are high or low. Here are the young men of Bree using the laser level to get the final grade for the subase. Men of Bree setting the final grade for the sub-base using the laser level. And some muscle.The receiver for the laser level is attached to the wood on the right. We really got a lot done in a day. The only thing left to do is tamp the subase with a flat plate tamper. 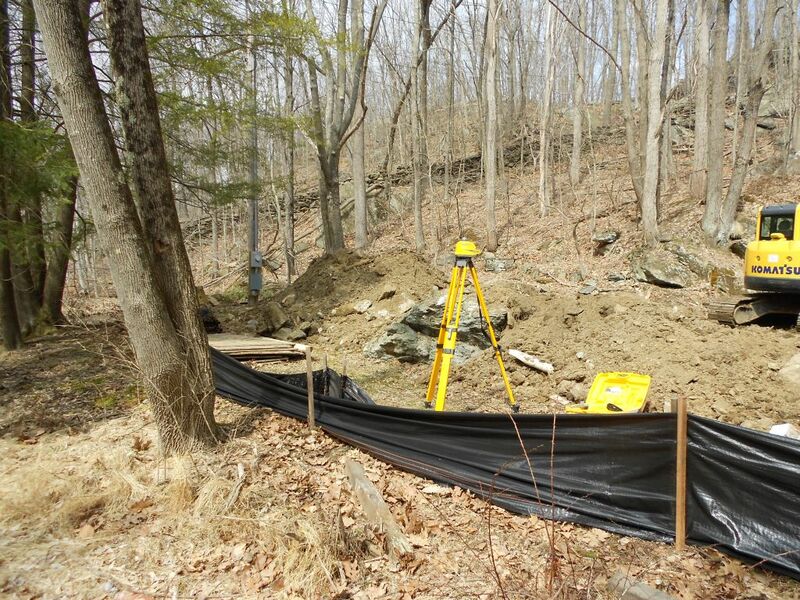 Then we can begin the footings! Before the “Men of Bree” got to the site I called and asked them to pick me up “Two eggs on a roll with bacon”. I want you to think about that for a moment mull it over and think what did I mean by that statement? Next week I will explain what I actually got in the bag from the deli. I think you will find it a tad interesting. Till then enjoy your work week.